Hostel City Break is modern, cozy, well known and good rated hostel located in Vracar- area known as heart of Belgrade, precisely in the Beogradska street (Belgrade Street), near to the biggest square Slavia.Philosophy of our hostel consist of - home atmosphere, friendly attitude towards guests, and a lot of positive energy. It is only 900 meters from the city center, Knez Mihailova street (Prince Michael Street) and Trg republike (Republic Square), the main square in the city and the largest shopping area in Belgrade. From the bus and railway stations the easiest way to get to City Break Hostel is to catch tram number 9 and on second stop is City Break Hostel (only 5 min. drive). 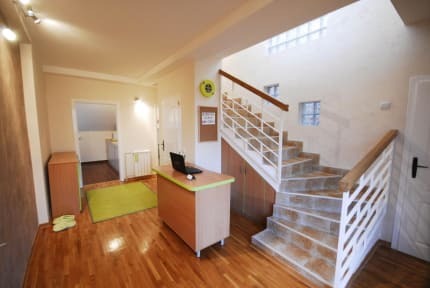 City Break hostel is a duplex on the fifth floor of the building, which consists of five separate bedrooms, four of them are located on the lower floor and one is on the top floor. City Break hostel has three bathrooms, two of them are located on the lower floor (one for male and one for female) and one is on the top floor. The living room on the lower floor features a fully equipped kitchen. The hostel has a small terrace near the entrace. The hostel has central heating in all rooms and bathroom. Internet wi-fi is available in every room 24h and is free for guests. In the living room on the lower floor a computer with free internet connection is available.